A common use case for AWS Step Functions is a task that requires human intervention (for example, an approval process). Step Functions makes it easy to coordinate the components of distributed applications as a series of steps in a visual workflow called a state machine. You can quickly build and run state machines to execute the steps of your application in a reliable and scalable fashion. In this post, I describe a serverless design pattern for implementing manual approval steps. You can use a Step Functions activity task to generate a unique token that can be returned later indicating either approval or rejection by the person making the decision. When the execution of a Step Functions state machine reaches an activity task state, Step Functions schedules the activity and waits for an activity worker. An activity worker is an application that polls for activity tasks by calling GetActivityTask. When the worker successfully calls the API action, the activity is vended to that worker as a JSON blob that includes a token for callback. At this point, the activity task state and the branch of the execution that contains the state is paused. Unless a timeout is specified in the state machine definition, which can be up to one year, the activity task state waits until the activity worker calls either SendTaskSuccess or SendTaskFailure using the vended token. This pause is the first key to implementing a manual approval step. 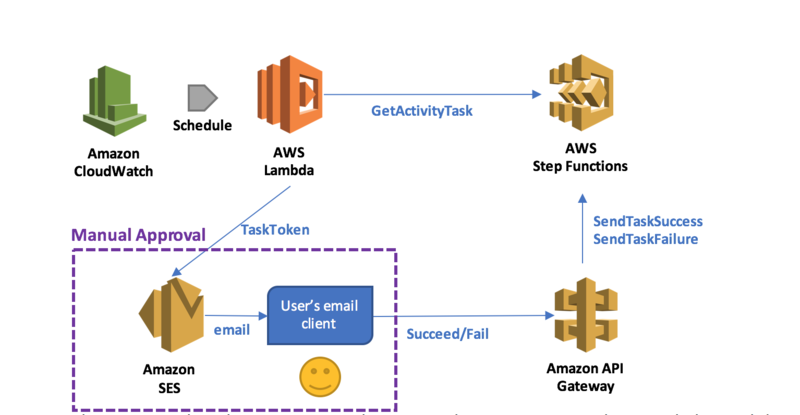 The second key is the ability in a serverless environment to separate the code that fetches the work and acquires the token from the code that responds with the completion status and sends the token back, as long as the token can be shared, i.e., the activity worker in this example is a serverless application supervised by a single activity task state. 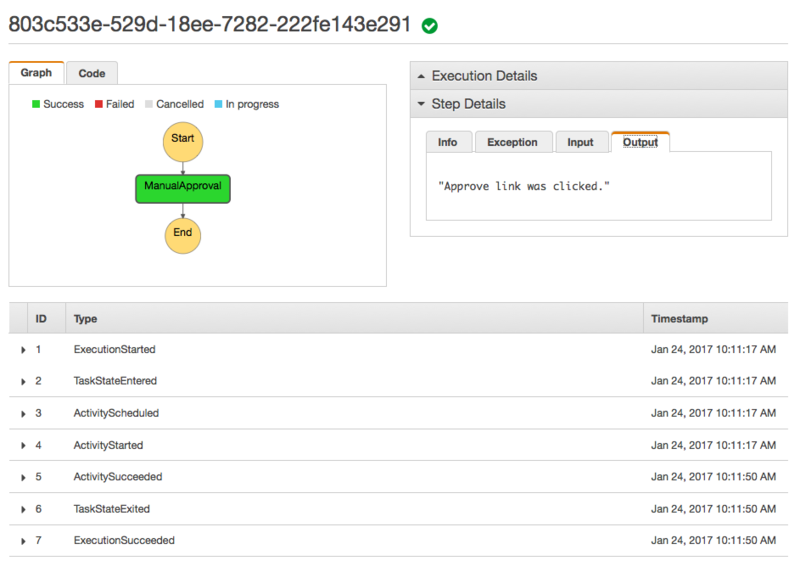 In this walkthrough, you use a short-lived AWS Lambda function invoked on a schedule to implement the activity worker, which acquires the token associated with the approval step, and prepares and sends an email to the approver using Amazon SES. It is very convenient if the application that returns the token can directly call the SendTaskSuccess and SendTaskFailure API actions on Step Functions. This can be achieved more easily by exposing these two actions through Amazon API Gateway so that an email client or web browser can return the token to Step Functions. 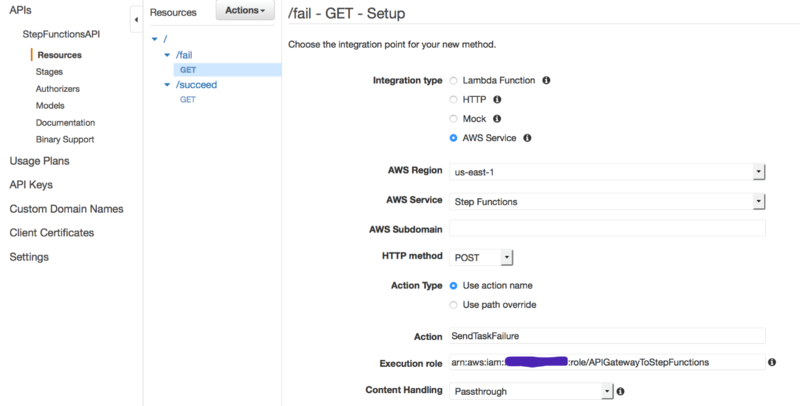 By combining a Lambda function that acquires the token with the application that returns the token through API Gateway, you can implement a serverless manual approval step, as shown below. In this pattern, when the execution reaches a state that requires manual approval, the Lambda function prepares and sends an email to the user with two embedded hyperlinks for approval and rejection. If the authorized user clicks on the approval hyperlink, the state succeeds. If the authorized user clicks on the rejection link, the state fails. You can also choose to set a timeout for approval and, upon timeout, take action, such as resending the email request using retry/catch conditions in the activity task state. As an example pattern use case, you can design a simple employee promotion process which involves a single task: getting a manager’s approval through email. When an employee is nominated for promotion, a new execution starts. The name of the employee and the email address of the employee’s manager are provided to the execution. You’ll use the design pattern to implement the manual approval step, and SES to send the email to the manager. After acquiring the task token, the Lambda function generates and sends an email to the manager with embedded hyperlinks to URIs hosted by API Gateway. In this example, I have administrative access to my account, so that I can create IAM roles. Moreover, I have already registered my email address with SES, so that I can send emails with the address as the sender/recipient. For detailed instructions, see Send an Email with Amazon SES. In the Step Functions console, choose Tasks and create an activity called ManualStep. Remember to keep the ARN of this activity at hand. Next, create the state machine that models the promotion process on the Step Functions console. Use StatesExecutionRole-us-east-1, the default role created by the console. Name the state machine PromotionApproval, and use the following code. Remember to replace the value for Resource with your activity ARN. Next, create and deploy public URIs for calling the SendTaskSuccess or SendTaskFailure API action using API Gateway. 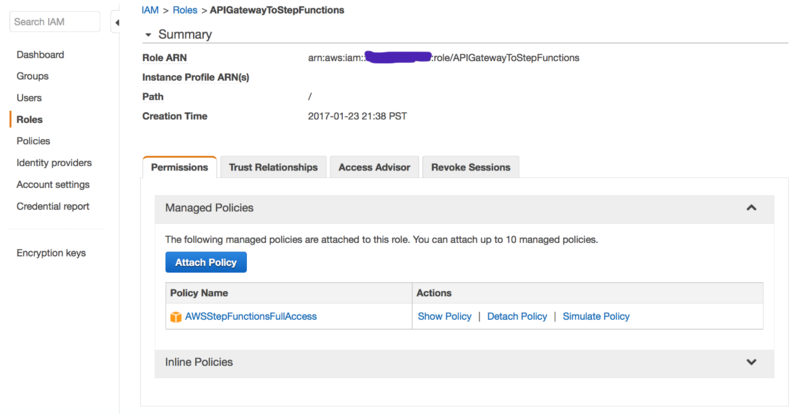 First, navigate to the IAM console and create the role that API Gateway can use to call Step Functions. Name the role APIGatewayToStepFunctions, choose Amazon API Gateway as the role type, and create the role. After the role has been created, attach the managed policy AWSStepFunctionsFullAccess to it. In the API Gateway console, create a new API called StepFunctionsAPI. Create two new resources under the root (/) called succeed and fail, and for each resource, create a GET method. For Integration type, choose AWS Service. For AWS Service, choose Step Functions. For HTTP method, choose POST. For Action Type, enter SendTaskFailure. For Execution, enter the APIGatewayToStepFunctions role ARN. To be able to pass the taskToken through the URI, navigate to the Method Request section, and add a URL Query String parameter called taskToken. When you are finished, choose Save. The last step on the API Gateway console after configuring your API actions is to deploy them to a new stage called respond. You can test our API by choosing the Invoke URL links under either of the GET methods. Because no token is provided in the URI, a ValidationException message should be displayed. 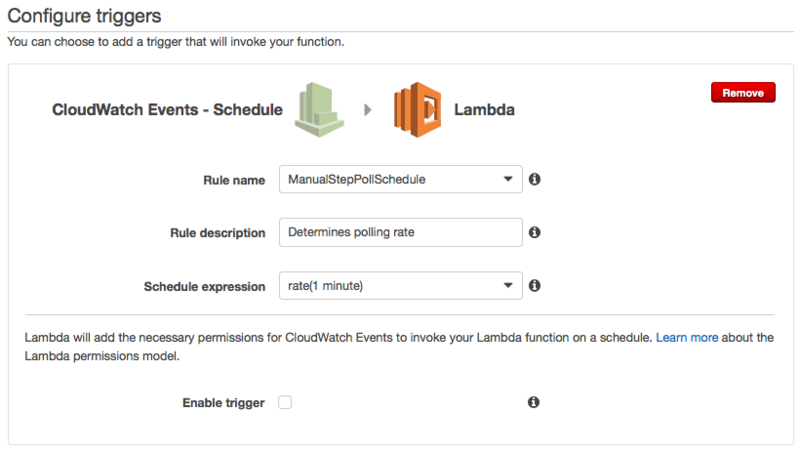 In the Lambda console, create a Lambda function with a CloudWatch Events Schedule trigger using a blank function blueprint for the Node.js 4.3 runtime. The rate entered for Schedule expression is the poll rate for the activity. This should be above the rate at which the activities are scheduled by a safety margin. The safety margin accounts for the possibility of lost tokens, retried activities, and polls that happen while no activities are scheduled. For example, if you expect 3 promotions to happen, in a certain week, you can schedule the Lambda function to run 4 times a day during that week. Alternatively, a single Lambda function can poll for multiple activities, either in parallel or in series. For this example, use a rate of one time per minute but do not enable the trigger yet. Next, create the Lambda function ManualStepActivityWorker using the following Node.js 4.3 code. The function receives the taskToken, employee name, and manager’s email from StepFunctions. It embeds the information into an email, and sends out the email to the manager. In the Lambda function handler and role section, for Role, choose Create a new role, LambdaManualStepActivityWorkerRole. In addition, as the GetActivityTask API action performs long-polling with a timeout of 60 seconds, increase the timeout of the Lambda function to 1 minute 15 seconds. This allows the function to wait for an activity to become available, and gives it extra time to call SES to send the email. For all other settings, use the Lambda console defaults. After this, you can create your activity worker Lambda function. You are now ready to test the employee promotion process. In the Lambda console, enable the ManualStepPollSchedule trigger on the ManualStepActivityWorker Lambda function. Within a minute, you should receive an email with links to approve or reject Jim’s promotion. Choosing one of those links should succeed or fail the execution. In this post, you created a state machine containing an activity task with Step Functions, an API with API Gateway, and a Lambda function to dispatch the approval/failure process. Your Step Functions activity task generated a unique token that was returned later indicating either approval or rejection by the person making the decision. 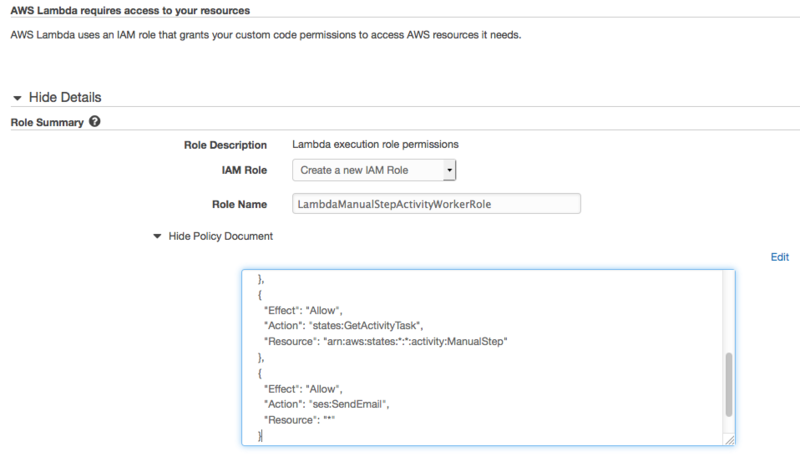 Your Lambda function acquired the task token by polling the activity task, and then generated and sent an email to the manager for approval or rejection with embedded hyperlinks to URIs hosted by API Gateway.